- The face value of the bond (bonds comes in a denomination of $1,000 so if you own 10 bonds, you own 10 x $1,000 = $10,000. - Coupon interest rate (the interest rate which is earned on the face value). - Interest payment dates (when the stated coupon interest amounts will be paid to bondholders. For instance, a bond that pays interest semi-annually means the payments will be made twice a year, usually on July 30th and December 31st of a year. - Maturity date (the date on which the full bond amount is repaid to bondholders along with the last coupon interest payment). 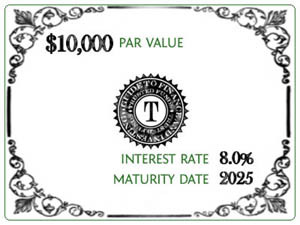 The yield to maturity rate is the effective market interest rate and is not included in the indenture because it is based on market conditions that change frequently, thus is assumed included in the indenture although it is not specifically stated anywhere in it. - Name of the independent trustee who will administer & oversee the bond issue including payments on coupon payment dates. - Any collateral or security that the issuing bond company will give to the bondholder in case of default.